Turnkey service masks complexity for global organizations. The interest in software-defined WANs (SD-WAN) has exploded over the past few years as businesses look to use WAN budget dollars more efficiently and improve application performance. Despite the popularity, global solutions are few and far between as most SD-WAN service providers are regional in nature. NTT Communications, the ICT solutions and international communications provider inside NTT, today took the covers off of a global SD-WAN service that spans 190 countries. Additionally, NTT Com becomes the first global service provider to transform its own network into one that is 100% software defined, enabling it to offer customers a broad set of additional WAN services. Looking ahead, the software-centric nature of the network should allow NTT Com the ability to roll out new, value-added services much faster than is possible with a traditional network. For the new global SD-WAN service and underlying software-based network, NTT Com is taking advantage of the technology gained in its 2014 acquisition of Virtela, an IT services pioneer, as I wrote at the time. Since its inception, Virtela had leveraged software to build an agile network, and had offered "software-defined" services long before that term become popular. Earlier this year NTT Com announced its SDx+M (software-defined everything plus management), and the new SD-WAN service certainly falls under that umbrella. The NTT Com service is built on an architecture that leverages more than 75 local cloud centers distributed across the globe so that it can offer localized service everywhere. Most existing SD-WAN solutions providers are targeting small to midsize organizations -- and SD-WAN can be problematic for larger enterprises that need to roll their own, particularly when it comes to leveraging broadband. Unlike MPLS, there is no global, or even nationwide broadband provider, so a large enterprise may have to procure broadband service from dozens or even hundreds of cable, DSL, or LTE providers. The complexity of this task alone could obviate any ROI the company is looking to gain with an SD-WAN. The NTT Com service offers connectivity flexibility as it supports any type of network service. 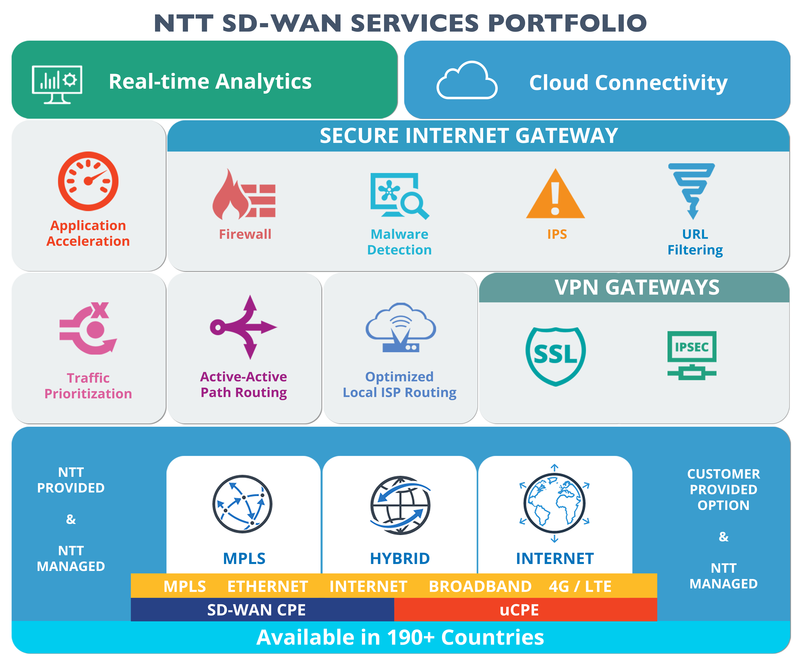 Also, NTT Com customers benefit from optimized cloud connectivity to all of the major SaaS and cloud providers for performance optimization. Real-time streaming network analytics enables enterprise-class customers to manage network traffic and application performance. The analytics enables businesses to understand the health of the end-to-end network as NTT Com continuously captures traffic flows. CPE flexibility gives businesses the choice of using an SD-WAN device from NTT Com or bringing their own. NTT Com has a huge engineering staff and can manage all of the leading physical or virtual SD-WAN appliances, including some white box options. Optimized local ISP selection and routing provides enhanced connectivity to more than 1,000 local network operators in more than 190 countries to connect customer locations to the network. Once the traffic hits NTT Com's network, it bypasses Internet peering and other points of congestion. This is another significant differentiator over the other SD-WAN providers that run over the top of the Internet. Enhanced quality-of-service (QoS) policy enforcement aims to improve the end-user experience. Unlike most local ISPs that do not have the ability to provide QoS to branch offices or other customer locations, the NTT Com service provides end-to-end QoS across the network. Internet security gateways and application acceleration for improved security and bandwidth optimization. The Internet security gateways are located inside NTT Com's local cloud centers and provide Web URL filtering, firewall protection, and intrusion protection, which can be enabled quickly through a customer portal. NTT Com also offers optional application acceleration to reduce bandwidth and optimize the performance of TCP-based applications. Users can use the NTT Com portal to configure these, too. SD-WANs are certainly interesting to talk and write about, but for large enterprises with locations in dozens of countries, the path to it can be filled with management, security, and application performance problems. NTT Com's new turnkey SD-WAN service masks the complexity so global organizations can quickly reap the benefits without exposing themselves to the risk of either rolling their own or having to cobble together a network comprising multiple regional providers. One hundred and ninety countries is certainly impressive, but it's the value added features such as connectivity flexibility, security, application optimization, and analytics that will enable NTT Com's customers to use the SD-WAN as the foundation for digital transformation.